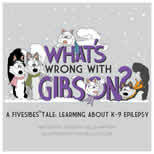 Idiopathic Epilepsy: meaning no known cause and possibly inherited. This is also referred to as Primary Epilepsy. Check history of pedigree and make sure your veterinarian has looked for possible underlying factors. Seizures caused by underlying factors are referred to as Secondary Epilepsy. The following tests are advised before a diagnosis of idiopathic/inherited epilepsy is made. Mild: (Petit Mal) this can be a simple as momentarily staring into space, or upward eye movement. Moderate: (Grand Mal) the dog falls down, loses consciousness and extends its limbs rigidly. Paddling of limbs, salivation followed by possible loss of control of bladder and bowels and vocalization (blood curdling scream) may follow. This may occur for 1-3 minutes and is most often followed by a period of restlessness, pacing, bumping into objects and loss of balance. (Post Ictal period) The dog is conscious but may appear deaf, blind and disoriented. Great care must be taken to prevent the dog from injuring itself at this time. The use of Bachs Flower Essence Rescue Remedy (found in any Health Food Store) has been found to be extremely useful when given at this time. Simply put a 4 drops of the Essence into the dog's mouth after the seizure has finished. In most dogs the post ictal time will be cut considerably. Status Epilepticus: Status can occur as one continuous seizure lasting 10 minutes or more, or a series of multiple seizures in a short time with no period of normal consciousness, this may be life threatening. Cluster Seizures: Multiple seizures within a 24-hour period time, may also be life threatening. It is often difficult to distinguish between the two types and veterinarian assistance is imperative. Rectal Valium is extremely useful in breaking cluster seizures. Keppra (Levetiracetam) was approved by the United States Food and Drug Administration in 1999. The exact mechanism by which levetiracetam exerts its antiseizure effects is not completely understood, although it is a different class of drug from other anti-seizure. It is well tolerated in human patients with minimal side effects. In dogs, levetiracetam is well absorbed after oral administration, is not significantly bound to protein, and is excreted in the urine with minimal liver metabolism. The elimination half-life in dogs is 3.3 hours (compared to 7.7 hours in people). Safety studies in laboratory dogs showed minimal adverse effects even at high doses (UCB Pharma, Inc. Data on file.) NCSU has been conducting extensive trials on Keppra. Diet plays an important role in the management of Canine Epilepsy. It is very important to feed a kibble that is preservative free. Preservatives such as Ethoxyquin and BHT, BHA should be avoided as they can cause seizures. Many "Supermarket " foods are loaded with chemical dyes and preservatives, buy a high quality kibble made from "human grade" ingredients or better yet cook for your dog or feed a raw ( BARF) diet. Many recipes can be found in Dr Pitcairn's Complete Guide to Natural Health for Dogs and Cats. Two helpful books on a raw diet are Dr Ian Billinghurst's "The BARF Diet" & Susan Johnson's "Switching to Raw". There is also a good article on the web site called " The Role of a Healthy Diet in the Management of Canine Epilepsy" PLEASE NOTE: If your dog is taking Potassium Bromide be very careful when you switch dog foods. Try to make sure the chloride content is the same as the previous food. Change over very slowly, whether it is the same chloride content or different, so that the absorption rate of the KBr remains constant.